Why have a Dermaplaning treatment at Therapy House? Dermaplaning is a pain free, effective method of manual exfoliation, designed to gently remove dead skin cells, dirt, debris and vellus hair ( peach fuzz) along with the build up of tan and make up products. The procedure involves the use of a blunt scalpel, which is used on clean, skin on the forehead, cheeks, chin, nose and neck. Will the treatment be beneficial for me? You can expect to see an instant improvement in skin texture and tone, while the long-term effects are increased cell turnover, fewer wrinkles and dark spots, reduction of acne scarring, and the removal of fine facial hair. Results are instant, and the vellus hair removed does not grow back thicker or darker. Removing the peach fuzz is beneficial since the fine hairs trap debris and oils and give skin a dull look. After Dermaplaning, skin care products and treatments perform much more efficiently since they can penetrate the skin more easily. Your makeup goes on noticeably smoother. Will the facial hair removed grow back darker? • No shaving, peels, waxing, electrolysis, depilatory creams, laser hair removal, sun exposure or aggressive exfoliations one week prior to your Dermaplaning treatment. • You should wait 7 days after receiving Botox or Dermal Fillers to receive the Dermaplaning treatment. • Stop using any exfoliating products that may salicylic acid, alpha hydroxy and glycolic acid. • Stop using any products containing Retinol, AHA, BHA or Benzoyl Peroxide. • Use a gentle cleanser and apply a hydrator at least twice a day for a minimum of 7 days after treatment. • Avoid sun exposure as much as possible for a minimum of 3 days after treatment. • If you must be in the sun apply an SPF 50 and reapply as often as you can. • Be careful of sun exposure and wear sunscreen every day for at least 2 weeks after treatment. • Avoid excessive heat for 3 days after treatment, for example heavy workouts, steam rooms, saunas, jacuzzis ect. • Avoid chlorine for 24 hours after treatment. • Avoid facial waxing for 7 days after treatment. • Avoid Dermal Fillers or Botox for 2 to 4 weeks based on area. • Do not pick, scratch, or aggressively rub the treated area. • No scrubs, polishers, or aggressive brushes should be used for 7 days after treatment. • Apply serums as absorption levels will be much higher. • You may experience slight peeling for the first few days after treatment. • A slight windburn sensation and/or blotchiness are normal for the first few days after treatment. • Skin care products may tingle or slightly burn for the first 2 days after treatment. • Rinse skin gently and pat dry. DO NOT RUB. • You may resume the regular use of retinol, alpha-hydroxy acid (AHA) products or bleaching creams 7 days after treatment. • Active cold sores, warts, cuts, sunburn, excessively sensitive skin, healing problems, dermatitis or inflammatory Rosacea on the face should be excluded from the Dermaplaning procedure. • If you have taken Accutane within the past year or received chemotherapy or radiation therapy you will also be excluded from the treatment. 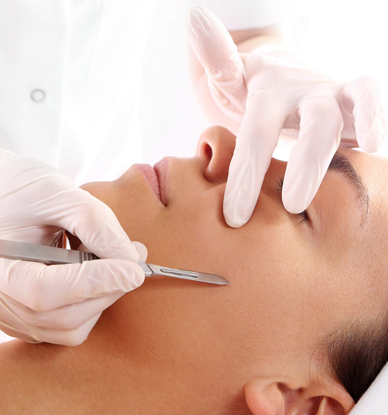 Want to know more about Dermaplaning treatment?